Calling all Gleeks out there! 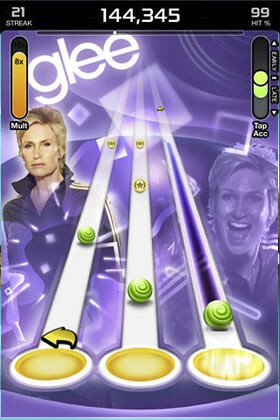 Fox Digital Entertainment and Tap Tap creators Tapulous have just announced the new game in the Tap Tap series for Glee fans to enjoy tapping and shaking with, called Tap Tap Glee. It’s free and it’s as good as the other Tap Tap games on the AppStore. With this FREE download, you get a total of three tracks to play with: “Don’t Stop Believin’,” “Hell To The No,” and “My Cup.” If you want more songs, there are more than 50 tracks available via in-app purchase. Gameplay is simple, just tap on the music beats which based on the songs played and seriously… you need to be able to follow music beats to enjoy this game. – Promo Track of the Day: Tap to a NEW promo track every day! – Connect to Facebook and represent as a GLEEK or JOCK. – Slushy your friends on their Facebook wall. – Check out info on your favorite Glee characters in the Yearbook section. 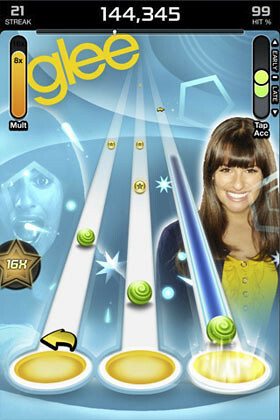 – Try your hand at Glee Trivia for a chance to top the GleeK of the Week leaderboard. Just a tip: in this app, you can watch a promotional video from “Glee: The 3D Concert Movie.” Look out for it (that’s.. if you are a Glee fan and care about the movie.. ahhaha). Watch this commercial below by Tapulous promoting Tap Tap Glee.